The DSC-780 and DSC-S750 have lofty-sounding model names, but don't be fooled: they're low end to the tune of $180 and $150. Do Not Want. At $180, this is not a lot of camera. For a little more, a gadget freak could hit up any other model in the line and do with a better feature set. They've got 8.1 and 7.2 MP ratings, 3x lenses equivalent to 35-105mm and 2.5-inch screens. They do basic face recognition, have lithium ion batteries and a 1-inch profile. 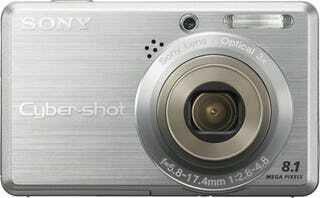 SAN DIEGO, Jan. 23, 2008 - Sony has enhanced the features and updated the design of its new Cyber-shot® DSC-S750 and DSC-S780 digital still camera models. Both of the new entry-level digital still cameras feature Sony's face detection technology, which identifies up to three faces in the camera's LCD frame and automatically adjusts focus and exposure for well-exposed, natural-looking photos. Sony has also upgraded the two models' power source to Lithium Ion batteries, instead of AA batteries, to extend battery life and allow for a body design that is just 1-inch slim. The DSC-S780 and DSC-S750 cameras can capture up to 270 and 280 shots on a single full charge, respectively. "Face detection is just one of the technologies we're introducing to help customers take better photos more easily," said Phil Lubell, director of marketing for digital cameras at Sony Electronics. The 8.1-megapixel DSC-S780 and the 7.2-megapixel DSC-S750 models incorporate CCD imagers, 3x optical zoom lenses, and 2.5-inch LCD screens for easy framing and viewing of photos. Higher sensitivity settings up to IS01250 have been added to both models to help reduce the risk of blurry photos when shooting in low-light conditions. Seven convenient scene selections, including twilight, twilight portrait, landscape, soft snap, beach, snow and high sensitivity, allow you to adjust quickly for specific shooting conditions. The cameras' five-point autofocus system helps take the guesswork out of picture taking by intelligently selecting the best focus for the subject. This helps to ensure that the subject is in focus, even if they are not in the center of the frame. The cameras are equipped with 22MB of internal memory so you can start shooting as soon as the camera is out of the box. Their capacities can be expanded easily with an optional Memory Stick Duo™ or Memory Stick PRO Duo™ media card, now available in capacities up to 16 gigabytes. Available in classic silver, the DSC-S750 model ships in March for about $150, and the DSC-S780 will be available in April for about $180. Options will include travel chargers, batteries, carrying cases, sports packs and other accessories, all sold separately. The models can be purchased online at sonystyle.com, at Sony Style® retail stores (www.sonystyle.com/retail), at military base exchanges, and at authorized dealers nationwide. Pre-orders begin on Jan. 31 at www.sonystyle.com.